Posted by M Bharath Bhushan in Congress, elections, GHMC, Hyderabad, Identity, politics, Settler, terrorism, TRS. The Telangana Rashtra Samiti (TRS) has denied that it was consulted by the Congress high command in a bid to resolve the separate Telangana issue. Posted by M Bharath Bhushan in CharMinar, GHMC, heritage, Hyderabad, Identity, Muslim, politics. The Quli Qutub Shah Urban Development Authority (QQSUDA) just exists for namesake, tucked away in the backyard of the crumbling old MCH building complex at Darulshifa. It is gasping for funds even as it is crippled by lack of powers and acute shortage of staff. Posted by M Bharath Bhushan in agitation, Andhrapreneurship, Bhadrachalam, compromise, Congress, corruption, Economy, heritage, KCR, Khammam, Koya, KTR, Polavaram, politics, ST, TRS, YSR. Hyderabad: TRS MLA K Tarakarama Rao on Monday announced that he would commit suicide in full public view if someone proves that his party or leaders got benefited from the Polavaram Project tenders. Speaking at the Assembly media point, Rao challenged TDP president N Chandrababu Naidu to prove the allegations that he levelled against the TRS leaders on the floor of the House during discussions on No Confidence Motion. Posted by M Bharath Bhushan in agitation, elections, politics. Posted by M Bharath Bhushan in agitation, compromise, corruption, Economy, Godavari, KCR, Khammam, Koya, Polavaram, politics, ST, TDP, Telangana, TRS, YSR. Posted by M Bharath Bhushan in Art, Articles, Culture, Telangana, Telugu, Warangal. Many centuries ago, when the radio, television and cinema had not even been thought of, audio- visual entertainment did exist! Many arts and crafts developed in various parts of the world, with an aim to entertain the people. Scroll painting was one among them. In those times, the scroll played the role of the visual medium and the song of the bard was the audio medium. Of all the various arts and crafts found in India, scroll painting is unique and different. This craft has been practiced, from time immemorial, in Rajasthan, Maharashtra, Bengal and Andhra Pradesh. 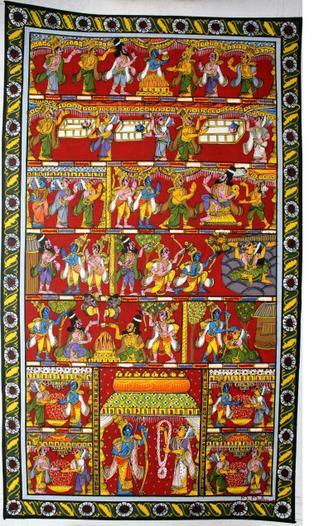 In Andhra Pradesh scroll painting is done in the little village called Cheriyal in Warangal district. Bards from the “kaki padagollu” community, used these scrolls to narrate stories from the Indian epics and other folk tales. The scroll would flow like a film roll. It was generally around three feet in width and went up to 40 feet in length, depending upon the story. Like large sized comic strips, each panel of the scroll depicted one part of the story. Hence, a scroll would easily have around 50 panels. As the bard would narrate the story, the panel depicting that particular part of the story would be displayed.